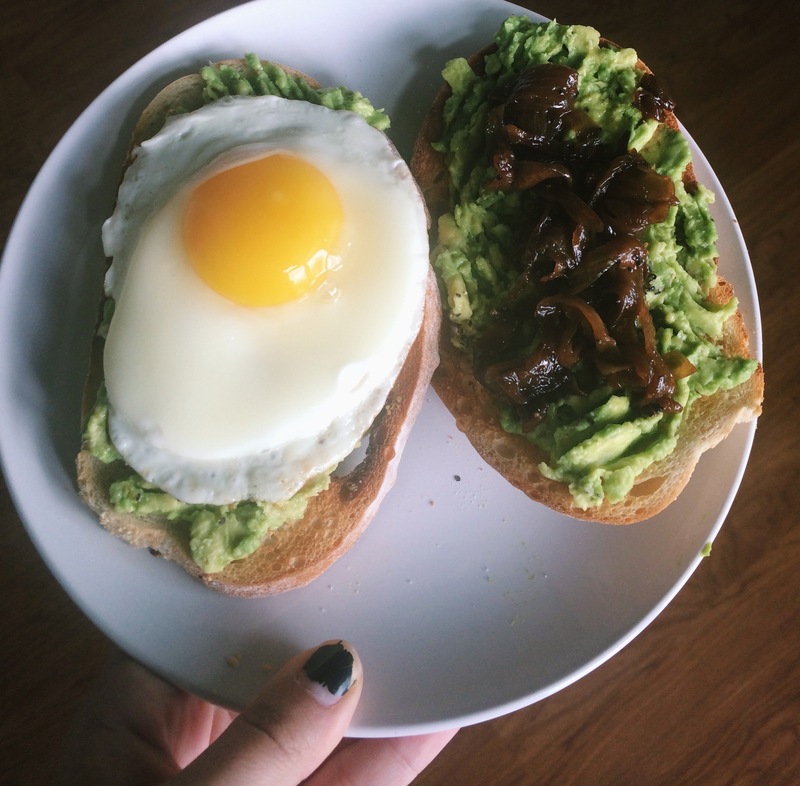 Back from the dead with……avocado toast. I have now been settled into my kitchen for over a week, cooking my own meals, and I have only gone out to eat once. And it was an emergency. But I have been eating a lot of avocado toast, as is my habit. Today’s was especially appealing, though. What I have learned to love about cooking is the trial and error. I like tinkering with a food until I see what I did wrong, and I like coming up with ways to fix it. That’s how these caramelized onions happened. I had struggled with them a few times before, always burning them or making some other mistake and I was so frustrated. There was nothing more I wanted than to make a perfect batch of caramelized onions. I finally figured it out the other day, leisurely stirring them over a low heat while I had a break between classes. I had the Food Network on and the apartment all to myself and I just devoted myself to the onions. For some reason, deglazing the pan with vinegar about 5 minutes before they’re done cooking then deglazing again with a little water about 30 seconds before they’re done cooking makes for an onion I really like….and a sprinkle of brown sugar doesn’t hurt either. I’ve been making batches now and letting them accumulate in my fridge and just putting them on every. little. thing. Also, to hell with my little perfect-circle-fried-egg gadget from Bed Bath and Beyond. The egg would leak out from underneath the metal and I make a pretty perfect fried egg without a stencil now. SO THERE, CORPORATE CONGLOMERATES.